The whole Christian world has watched with fascination as Pope Francis, over the past several months, has reached out to evangelicals. Who can forget the mesmerizing iPhone video, filmed by the Pope’s (late) friend Bishop Tony Palmer, in which the Bishop of Rome communicated, with father-like compassion, to a national gathering of American evangelical leaders? 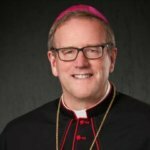 His smile, his tone of voice, and the simple, direct words that he chose constituted a bridge between Catholics and evangelicals. What I found particularly moving was the remarkable reaction of the evangelical audience after they had taken in the video: a real prayer in the Spirit. 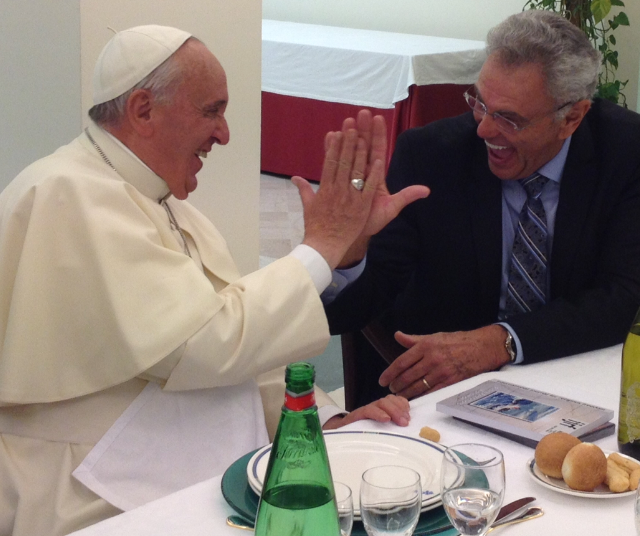 And who could forget the high-five – reportedly the first of Pope Francis’s life – exchanged with Pastor James Robison, after the Pope insisted that a living relationship with Jesus stands at the heart of the Christian reality? Many Catholics were surprised when the newly-elected Pope Francis asked the crowd gathered in St. Peter’s Square to pray for him, but evangelicals from Argentina weren’t taken aback, for they had witnessed something very similar. In June of 2006, Cardinal Jorge Mario Bergoglio was attending a meeting of evangelical pastors in Buenos Aires, and after he had spoken to them, he knelt down on the stage and asked them to pray for him and to bless him. No one doubts that Pope Francis has a genius for the provocative symbolic gesture: washing the feet of women and non-Christians on Holy Thursday, paying his own hotel bill in Rome, opting to reside, not in the opulent Apostolic Palace but the far more modest Casa Santa Marta, driving in a tiny car while at World Youth Day in Rio, etc. But does his outreach to evangelicals go beyond the merely symbolic? Is it grounded in more substantial theological commitments? I would argue the affirmative and to do so on the basis of Francis’s Apostolic Exhortation Evangelii Gaudium (The Joy of the Gospel). Catholics have tended to be suspicious of the language of personal relationship with Jesus, especially as it has appeared in evangelical Protestant rhetoric over the past half century (accepting Jesus as my ”personal Lord and savior”), and this for two basic reasons. The Pope concludes with a wonderfully understated rhetorical question: “Why should we not also enter into this great stream of joy?” Why not indeed? Displaying his penchant for finding the memorable image, Pope Francis excoriates Christians who have turned “into querulous and disillusioned pessimists, ‘sourpusses,’” and whose lives “seem like Lent without Easter.” Such people might be smart and they might even be morally upright, but they will never be successful evangelists. When he spoke at the General Congregations, the meetings of Cardinals in advance of the conclave of 2013, Cardinal Bergoglio reportedly brought to his brothers’ attention with great passion the need for the Church to look beyond herself. This preoccupation is echoed in paragraph 27 of Evangelii Gaudium: “I dream of a ‘missionary option,’ that is, a missionary impulse capable of transforming everything, so that the Church’s customs, ways of doing things, times and schedules, language and structures can be suitably channeled for the evangelization of today’s world rather than for her self-preservation.” And this in turn echoes a word that John Paul II spoke to the bishops of Oceania in 2001: “All renewal in the Church must have mission as its goal if it is not to fall prey to a kind of ecclesial introversion.” And the mission, once again, is none other than drawing the entire human race into a relationship with the living Christ. There is much here, I would suggest, with which evangelicals can resonate. Pope Francis realizes that in our postmodern framework, appeals to the true and the good often fall on deaf ears. Indeed, if the dictatorship of relativism obtains, then who are you to tell me what I ought to think or how I ought to behave? This is why the Pope calls for an active exploration of the via pulchritudinis (the way of beauty). It is best for the evangelizer to show the splendor and radiance of the Christian form of life, before he or she would get to explicit doctrine and moral commands. This involves the use of classical artistic expressions of the Christian faith as well as contemporary cultural forms. Indeed, says the Pope, any beautiful thing can be a route of access to Christ. If I might end on a note of challenge, or better, of invitation to further and deeper conversation. Along with so many others, I was encouraged by the late Bishop Tony Palmer’s outreach to Pope Francis and his ecumenical graciousness. But when he told the gathered ministers that, in the wake of the famous 1999 joint declaration on justification, Luther’s protest is effectively over, I was, to say the least, not convinced. We have made enormous strides in the last fifty years, and as I’ve suggested here, the papacy of Francis represents another astonishing leap forward. Nevertheless, as we approach the five-hundredth anniversary of the Protestant Reformation, significant differences remain at the doctrinal level, including and especially in regard to the issue of justification and its appropriation. In the early 1940’s, the Protestant theologian Karl Barth conducted a seminar in Basel on the texts of the Council of Trent, and to that seminar he invited Catholic thinker Hans Urs von Balthasar. I’m not at all sure that these two giants resolved anything, but I remain entranced by the image of the greatest Protestant theologian of the twentieth century and arguably the greatest Catholic theologian of the twentieth century coming together for serious conversation regarding the central issues of the Reformation. I am exceptionally glad that in many circles we have moved well beyond the stage of hurling invective at one another and that we have indeed found many, many points of contact, especially concerning the centrality of evangelization. But I would still welcome more and more encounters along the lines of the Barth-Balthasar seminar. Toward that end, may we all follow the evangelical drumbeat of Pope Francis.